ST. GEORGE — Missing almost a week now, 17-year-old Desert Hills High School senior Macin Smith may have been seen hitchhiking on an onramp to Interstate 15 in St. George. 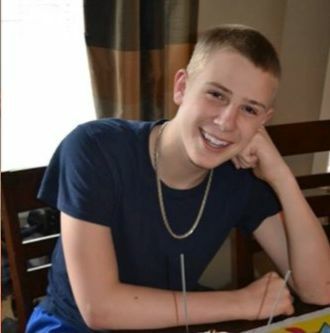 Tips received by the St. George Police Department and on St. George News Facebook page have yielded reports of the St. George teen being spotted Tuesday on Brigham Road in St. George. Macin Smith was reported standing at the onramp to southbound I-15. “We’ve had some tips that he was holding a sign on I-15 that said Las Vegas,” St. George Police Sgt. Rich Triplett said, adding the tips were several days ago and there has been nothing since then. “Nothing’s making sense. But I’m trying to make sense out of a teenage brain and that’s probably … I don’t know,” Tracey Smith said, as her voice trailed off. Macin Smith was last seen Tuesday morning as he was waking up for school. His mother said she was not even sure if her son got on the bus that morning. Tracey Smith – Telephone 435-256-5509. Probably met a girl online and went to see her. I found your comment interesting and highly likely because i felt the same thing. And i also saw a blond girl associated with him. Honestly, Laughing Out Loud are you? You have once again proven yourself to be an a..*hole, jacka..* and the like. Edit all you want Editor, but this is just crazy. You may find this story completely “un-newsworthy”, but I venture to guess that by and far the majority of the local readers really do not care about your opinion. Share all you want, it is a free and apparently wide, wide, wide open “news” forum, but you are still a scumbag. 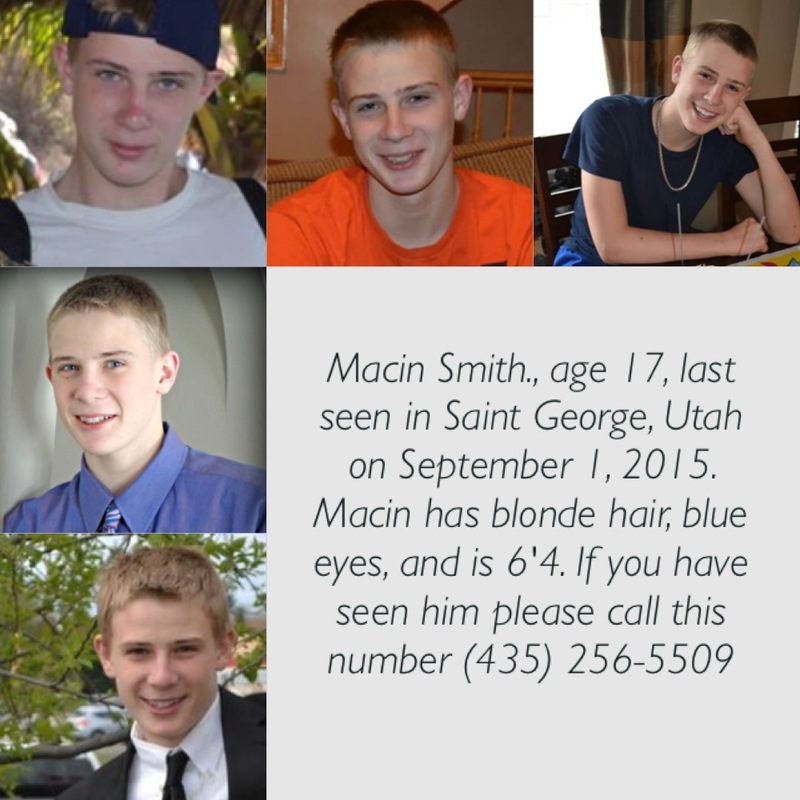 As for Macin Smith, I hope he is fine and comes home soon. Potty mouth. Does your Bishop know you talk like that. Are you guys listening to yourselfs? Of course you should be worried if he’s missing and ran away. He is a great kid. He’s my friend and you guys wouldn’t know what’s going on at home. You can’t just say oh he’s a big kid forget about him there are other important things in the world. Well let me tell you something he’s a person just like you. I’m pretty sure if you ran away and someone said he’ll be okay he grown up, I’m pretty sure you would be a little bit sad. So next time you decide to post a comment like that put yourself in his shoes. Thank you. Hey Nate, how well did you know Macin? I find it hard to believe Macin knew no one in Vegas. I have a child the about the same age at DHHS and they have had several good friends from DHHS move to Vegas as well as plenty of people they knew from working together in classes over the past few years. I don’t allow my kids on social media but I know many of the kids that moved to Vegas still keep in touch via social media or playing online games. I wish they would release more information. The school has cameras at every doorway. They know if he was on the bus and got off. His mom said she woke him up at 7:30am, that is about the same time the bus picks up? Did he just run out the door in what he was sleeping in. Then if he was at the Pilot station, do you think he walked from Little Valley to the pilot station or rode the bus to DHHS and walked from there? Something is not adding up in the few facts we got. The mom seems too calm. On day one I would have been outside the high school talking to every student I could and freaking out. Macin was new to the school and moved from Canada. … we do need to find him as soon as possible. He packed no food, clothes, wallet or even money that was on his stand. We did get a caller saying he was on I-15 holding a sign. But I would imagine a lot more people would’ve notice a tall lurky boy holding the sign and would’ve called in with the same tip. I’m his sister … Each day this nightmare becomes harder and harder. Give it a break Fun Bag. Your not sounding too swift today. Go back to reading the funny paper. I understand where you are coming from but there is more to the story. This is just a small coverage of it. … He packed no food, clothes, wallet or even money that was on his stand. We did get a caller saying he was on I-15 holding a sign. But I would imagine a lot more people would’ve notice a tall lurky boy holding the sign and would’ve called in with the same tip. People that claim they don’t let their kids on social media…. NEWS FLASH.! your kids are on social media they go to their friends house and go online.! I have to laugh at parents that think their kids are not on social media. We have had investigated and there was nothing on his phone and nothing on his lap top. We have looked at his past history and even broke into his Facebook. There is nothing there. And he left it all behind. Macin just moved and had only been at school a week. Hardly any time to make friends. FYI- Facebook is social media. The fact that you had to ‘break in’ to his account means you didn’t know the password, which also means there will be other things you aren’t aware of. My daughter was a sneaky girl that was not allowed to be on social media, but had a ‘secret’ facebook account that also happened to be a DECOY from her ‘real’ facebook account. She still got caught, and you would not believe the people she was talking to on the real facebook account! DO NOT ASSUME that he didn’t have other accounts, or people he was in contact with. It’s a fools wish to believe he was so innocent as to not. I’m sure REAL LIFE will be along any moment now and say something stupid like he always does. because I posted a comment.. He doesn’t like me.. Oh boo hoo LOL.! Macin, this hurts your family deeply, at least go to a payphone and leave them a message and tell them whats going on. Mothers can get chronic health problems almost over night having serious grief for their childrens whereabouts.. People that agree that you should leave home and not tell anyone, do not have your best interest at heart and you need to get away and call a friend from school or someone. if you are by chance mad at your family, believing you are in serious danger, scaring them to death, is not fixing the problem. when my son was missing i nearly had a stroke from the grief.. plz call your family big guy. Hope it all works out, praying for ya. This is exactly what I wanted to say to Macin. Please, Macin, pay attention to the people who really care about you. Let us know what is happening. Be very, very careful out there. And this news source almost never cleans up terrible comments. Your comments got them to take action. Wow, Fremont Street was packed like sardines, didn’t see macin. Macin, call your mother!!! Yawwwwwwwwwwn another mental moment from the village idiot… Ok everybody applause for REAL LIFE because he feels left out..